DON'T MISS THE PICTURES BELOW! Questions? Ask them in the easy-to-use form at the bottom of this page and we'll email you a response within 24 hours! This is a nice set of wooded properties in the beautiful town of Villa Grove, Illinois. In the floodplain of the Embarras River which runs just north of these two properties, these lots provide the feeling of a serene and wild landscape in the middle of a small town. The property offers the potential of a great campsite or recreational property, not to mention a great long term investment opportunity. Tract A (west) is 1.63 acres, while Tract B (east) is 0.75 acres. Together, these properties represent a whopping 2.38 acres of land, an impressive size to find in town! Both properties are accessible by paved city streets. We are willing to work with buyers to find a payment solution that is affordable and meets your needs. You can purchase this property one of two ways. The first is with a cash offer, either with cash from savings or from a bank loan. The second is to get financing from us in the form of a contract-for-deed, which is a form of seller financing that helps buyers avoid the difficult and costly process of going through a bank to obtain a mortgage loan. The minimum requirements for this type of arrangement is: 1) a 15% downpayment; 2) monthly payments of at least $250; and 3) interest of 7.0% per year. Paying more per month would reduce the length of the financing and there are no penalties for paying it down early. In the event you want to take advantage of this financing, we will work with you to arrange a satisfactory monthly payment. Once the last payment has been made, the deed will be transferred to the buyer. Before entering a contract-for-deed, it is important to make sure that you can afford all of the payments until the financing is completely paid off. A default could result in loss of the property and any funds paid up to the time of default, similar to a mortgage loan. 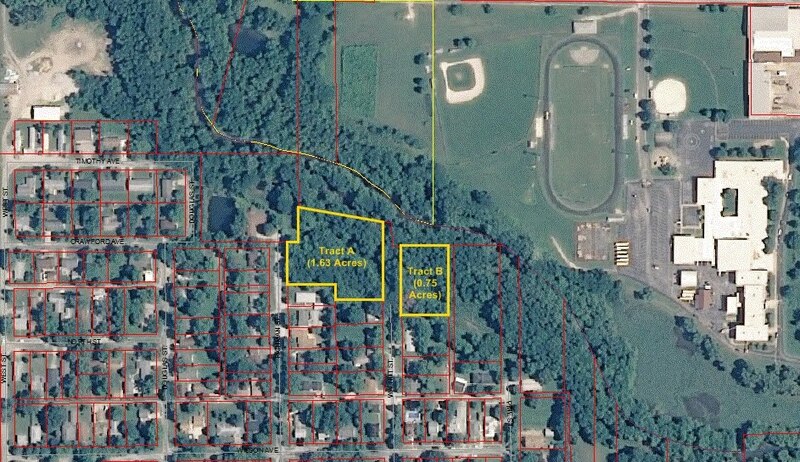 Below is an aerial photo of the property. As you can see, these lots are huge compared to the size of house lots in this area! They have excellent access along North Richman Street (Tract A) and Walnut Street (Tracts A & B). The Embarras River runs along the north side of the properties providing recreational opportunities such as fishing, canoeing, or kayaking. The Google map below shows the location of the Villa Grove Lots. Tract A is west of Walnut Street and Tract B is east of Walnut Street. Please note that you can switch to a satellite aerial view of the properties by clicking on "Sat" in the top right corner of the map.